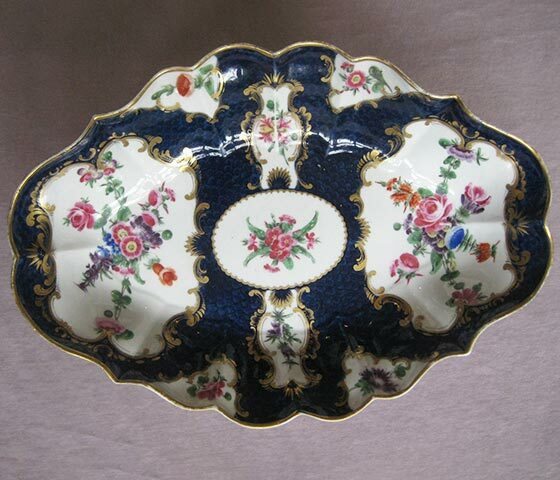 S2705 A Bow plate painted with bouquets and sprays of puce , blue and yellow flowers within a chocolate lined wavy and shaped rim. 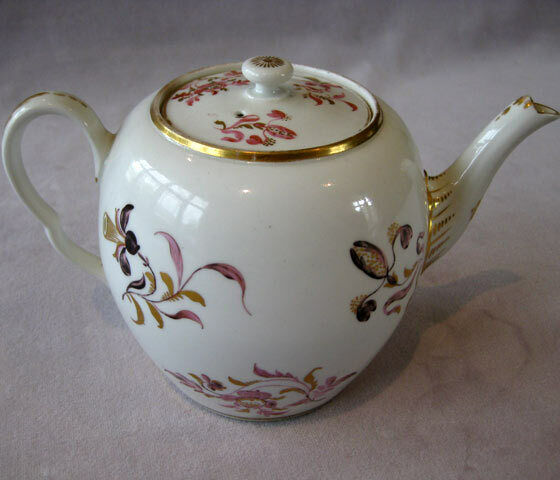 S2946: A Worcester Giles decorated ribbed and barrel shaped tea pot with the simple but elegant Queens pattern.The knop is a single rose with a stem and two leaves lying flat. 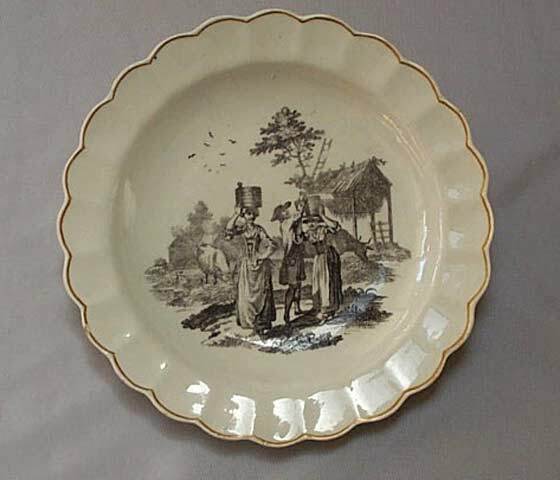 S2950: A fine Longton Hall strawberry plate. The moulded edge with green leaves with puce veins and red berries. 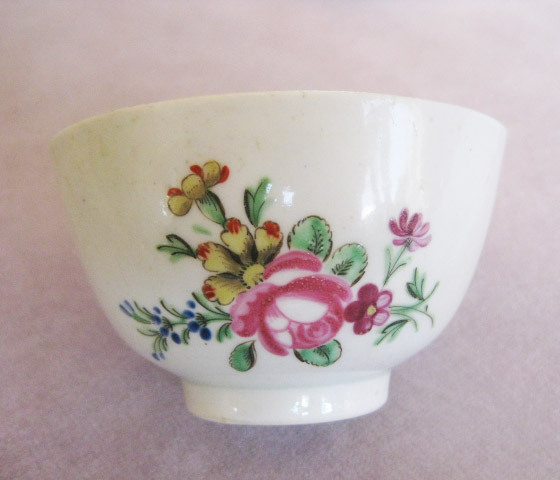 The centre with finely painted floral sprays and sprigs. 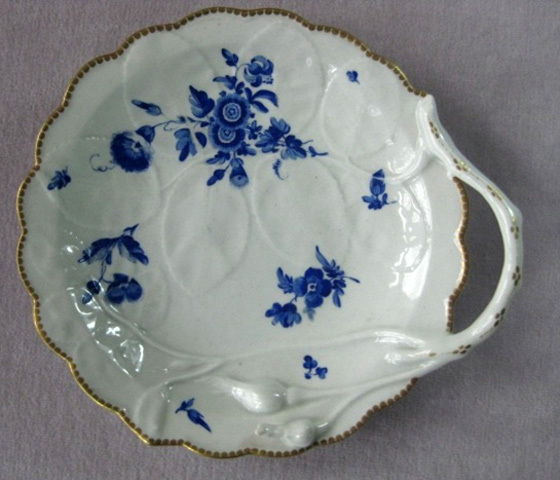 S2590 : A Worcester “ Blind Earl” dish with gilt dentil rim and painted in the dry blue manner with scattered sprays. 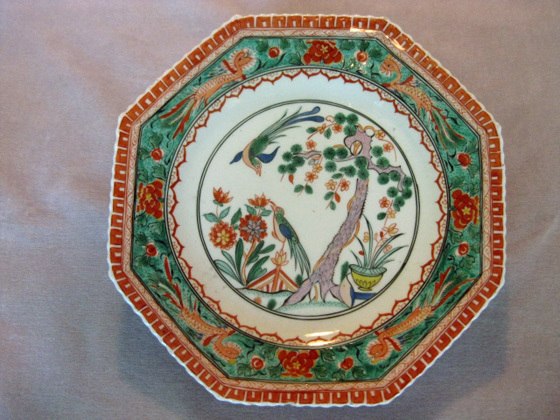 S2290: A Worcester plate painted in bright enamels with the "Dragons in Compartments" pattern. 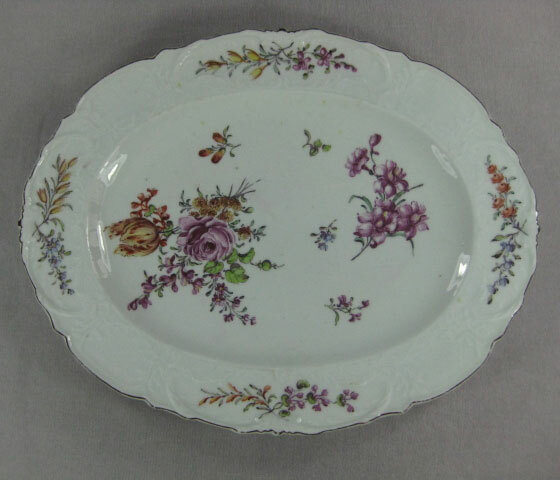 S2902 : A Chelsea porcelain silver shaped dish simply decorated with floral bouquets and sprigs and with a brown lined rim. 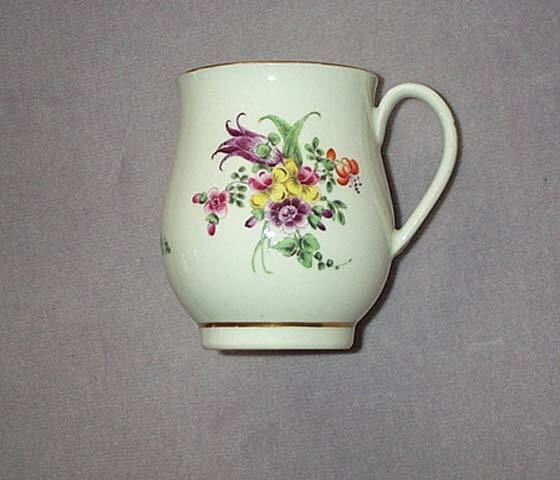 S2295: A Bow bell shaped mug with a grooved handle and painted with a bouquet of flowers beneath a flower scroll and diaper border. 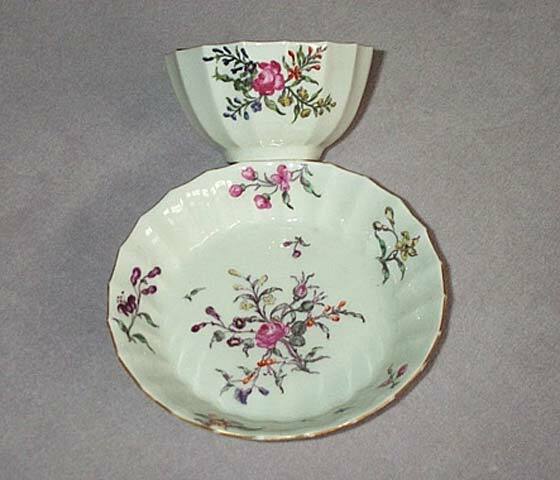 S2307: A Worcester tea bowl and saucer of fluted form and finely painted with English garden flowers. 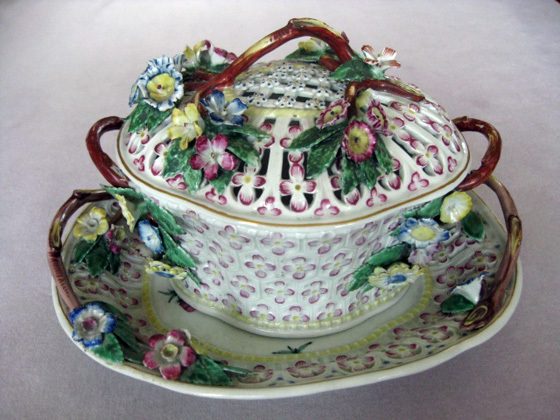 S2782: A Samson hard paste porcelain chestnut basket and stand copying the Worcester model of the 1780’s. 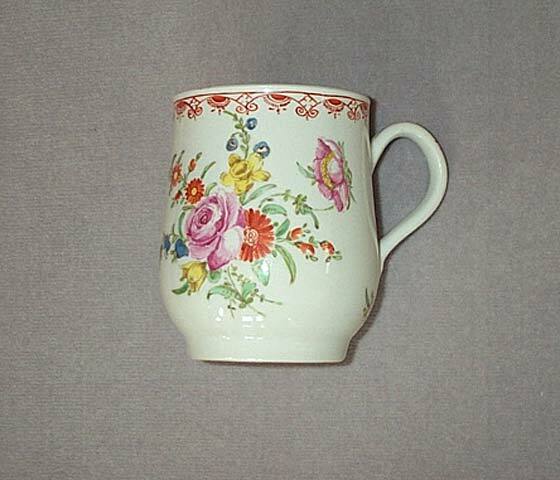 S2304: A Worcester bell shaped mug of small size and finely painted with floral bouquets and sprigs. 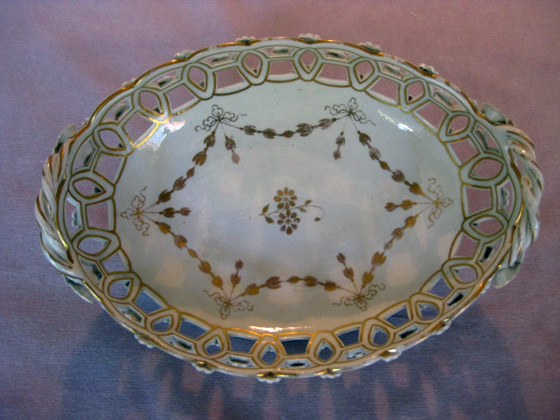 A grooved handle is gilt decorated and gilt lines to rim and base. 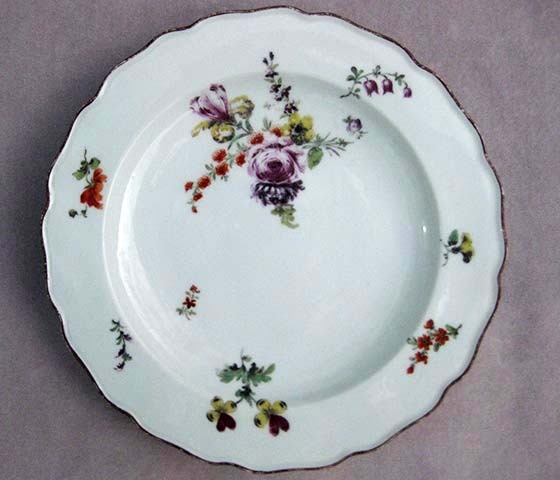 S2629: A finely decorated Chelsea moulded edge oval shaped dish painted with a rose and a tulip and with other garden flowers. 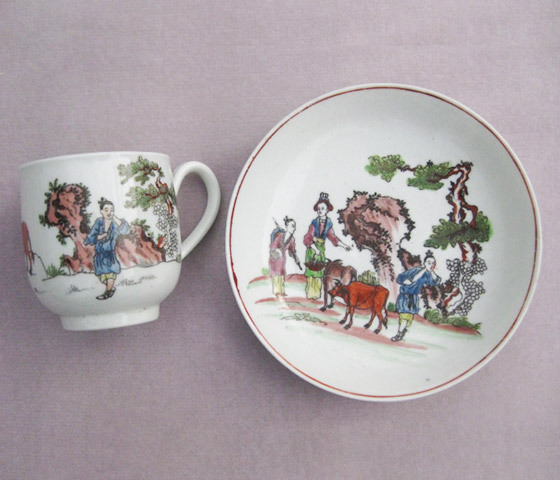 Price code: F S2813: A fine Worcester cup and saucer printed and painted with the “Red Bull” pattern and a red line border to the inside of the cup and edge of saucer. 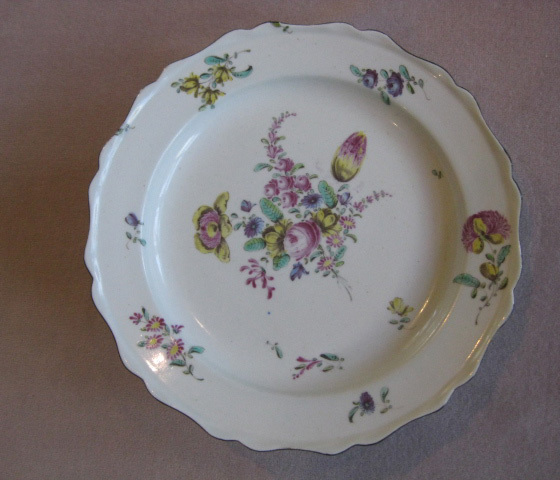 S2814: A Bow octagonal plate with a moulded prunus border and decorated in the famille rose style with a flowering bush to the centre and further scattered flowers to the rim. 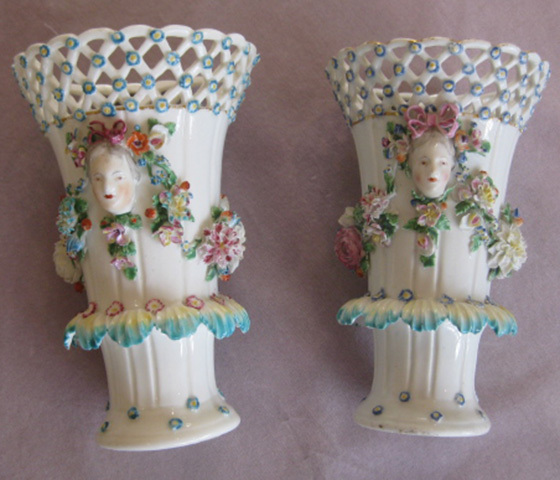 S2671: A fine pair of Derby frill vases of exceptional quality. 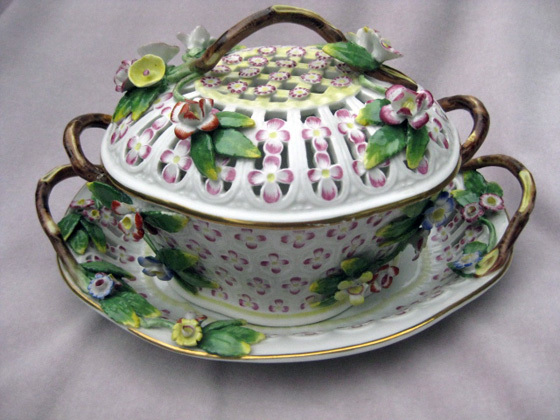 With swags of finely modeled flowers hanging from cherubic faces capped with a pink bow.Fret cut top with blue & yellow florets to the intersections. 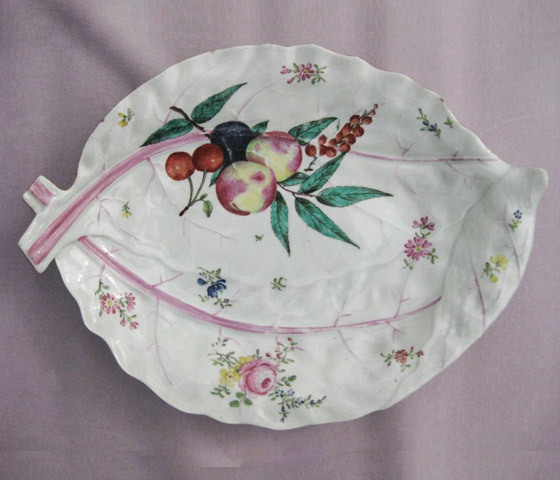 S2815: A Worcester moulded and cabbage leaf shaped plate with puce veins and painted with scattered floral sprays and with cherries, plums, peaches and berries and foliage in the Giles manner. Gilt edge. 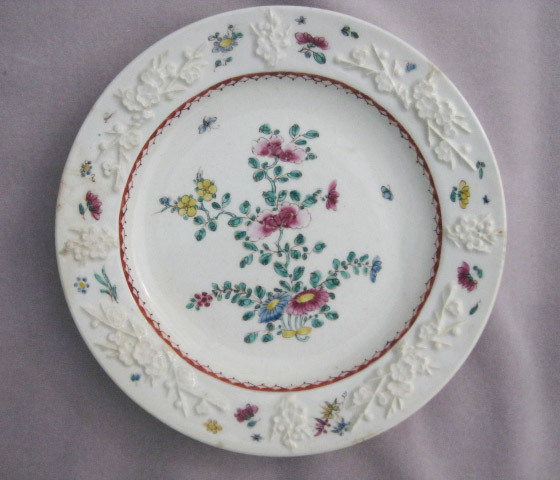 S2957: A Chelsea red anchor plate with a wavy moulded edge and nicely painted with sprigs and sprays of flowers. 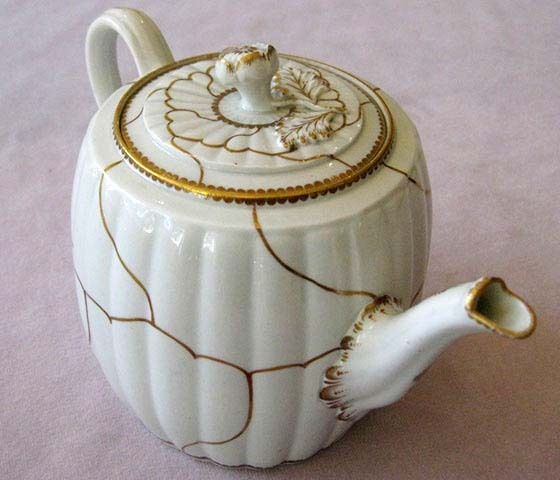 S2429: A Worcester tea pot with a button knop and a shaped handle. 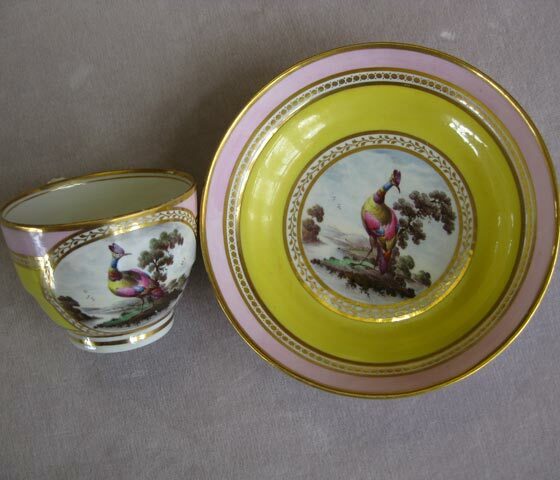 painted with pink and gilt flowers and sprays and gilt decoration to rims, handle & spout. 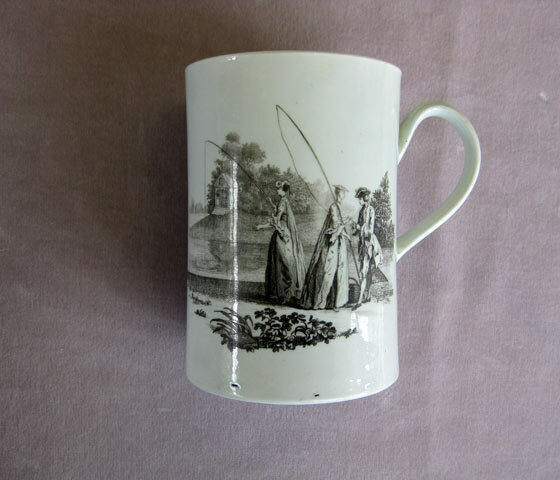 S2432: A Worcester mug finely printed in black on glaze with the “ Whitton Anglers” to one side and the, seldom found “Minuet” to the other. 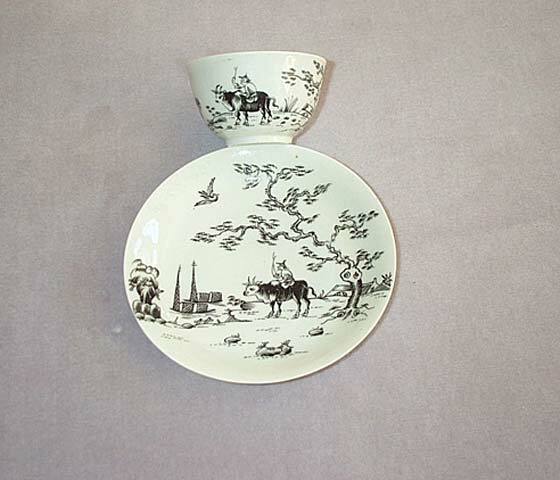 P2: A Worcester tea cup and saucer decorated by James Giles. 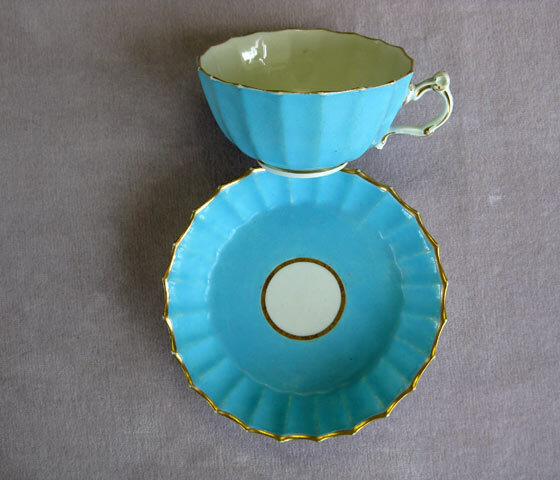 It is of fluted form and painted in a soft turquoise with gilt edges and gilt decoration to the shaped handle. 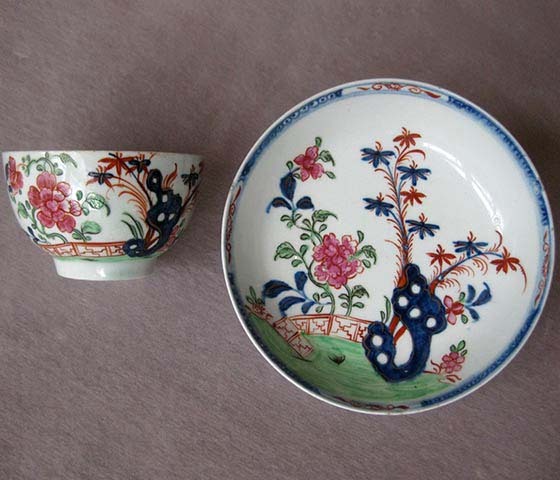 P3: A Worcester tea bowl and saucer brightly painted with floral sprays and sprigs. Line , dot and loop borders. 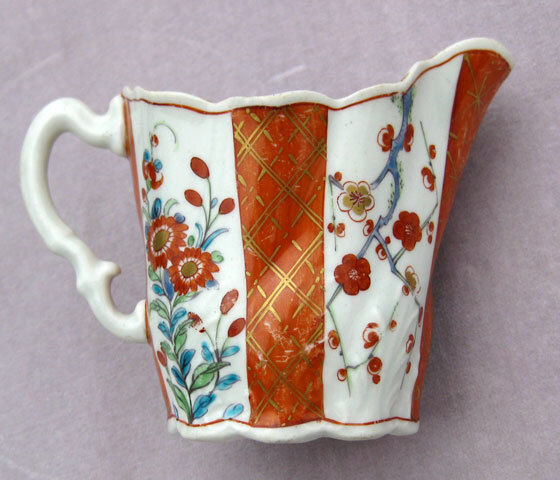 S2444: A Worcester “high Chelsea ewer” creamer finely painted in the Kakiemon manner in the “Scarlet Japan” pattern with orange and gilt panels dividing panels of floral painting. 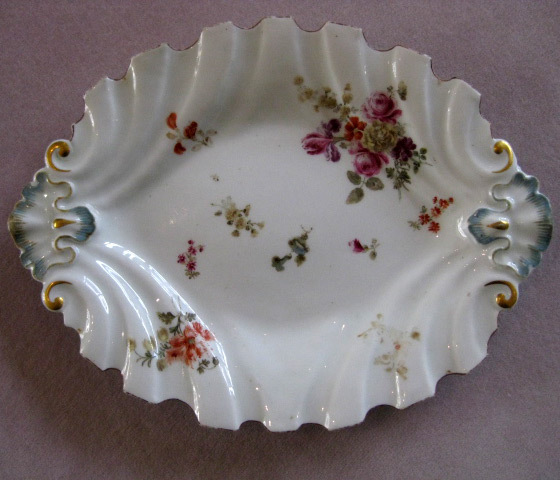 S2965: A Worcester blue scale lozenge shaped wavy edged dish with gilt reserves containing sprigs and bouquets of flowers. 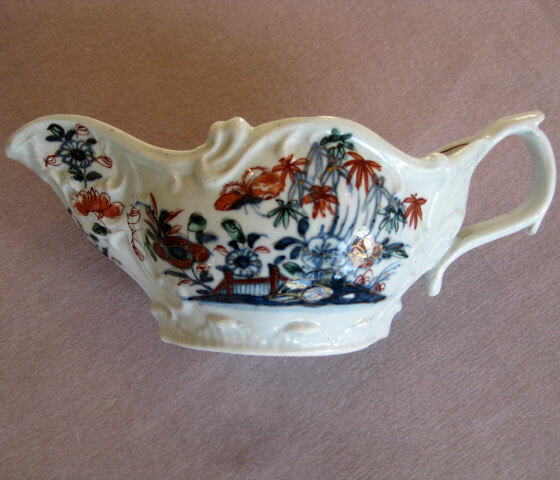 S2484: A Richard Chaffers moulded sauce boat painted in underglaze blue and overglaze green,red and gilt with an Oriental garden scene to either side. 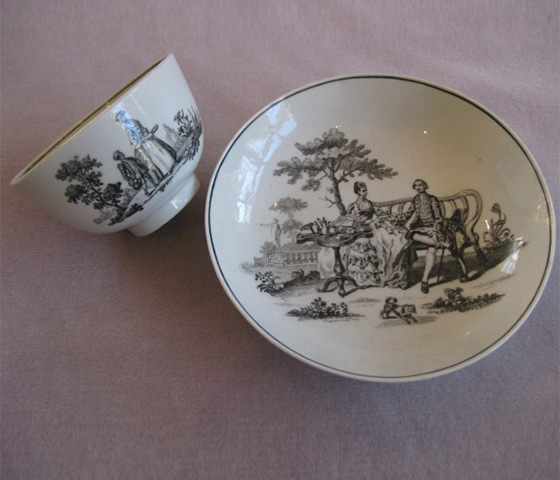 S2914 : A Worcester tea bowl and saucer with Hancock prints of The Tea party no.2 and the Maid and Page to the bowl and the Tea Party no.2 to the saucer. 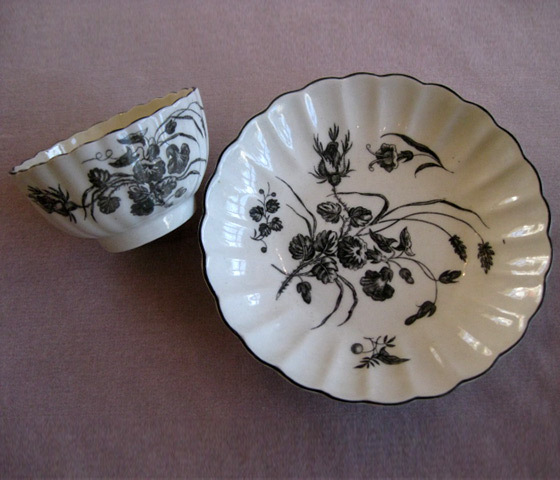 S2915 ; A very rare Worcester fluted tea bowl and saucer finely printed in black with flowers and leaves including convolvulus , rose bud and others. Black line to the edges. 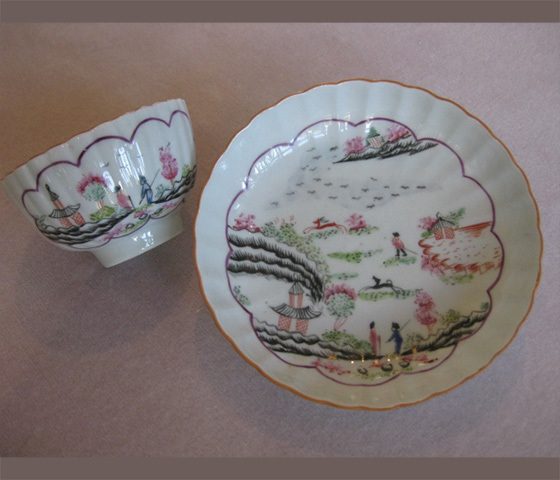 S2967: A Lowestoft tea bowl and saucer brightly painted with a fence , rock and peony in the Redgrave style. 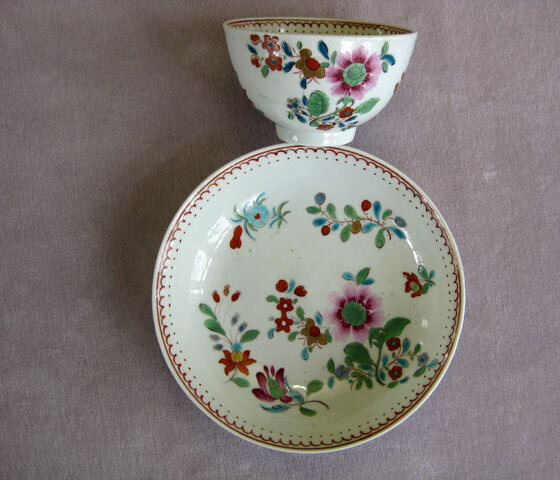 S2824: A Lowestoft tea bowl painted with floral sprays and with a green line edge to inside the bowl. 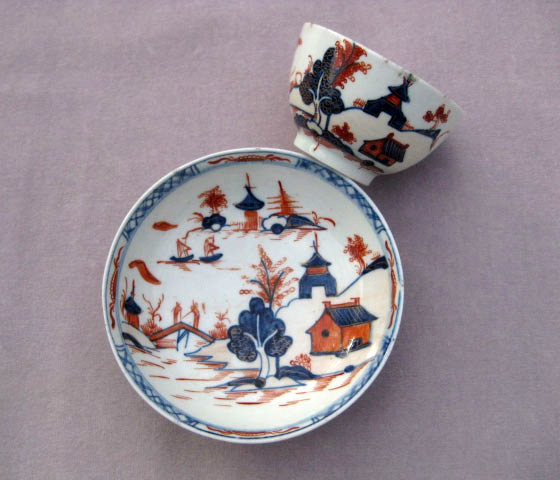 S2707 A Chamberlain decorated tea bowl and saucer painted with the "Hunting in compartments" pattern. 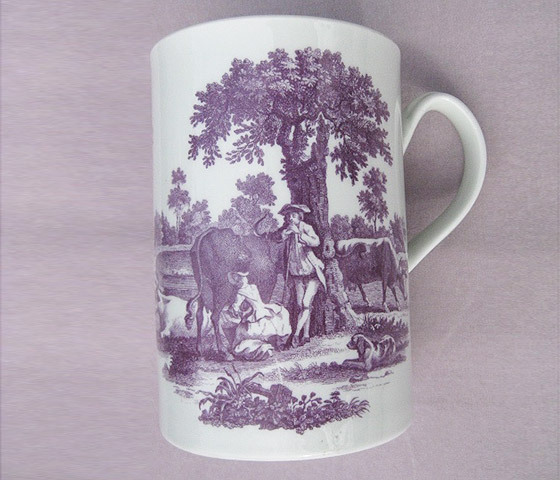 Possibly Caughley porcelain. 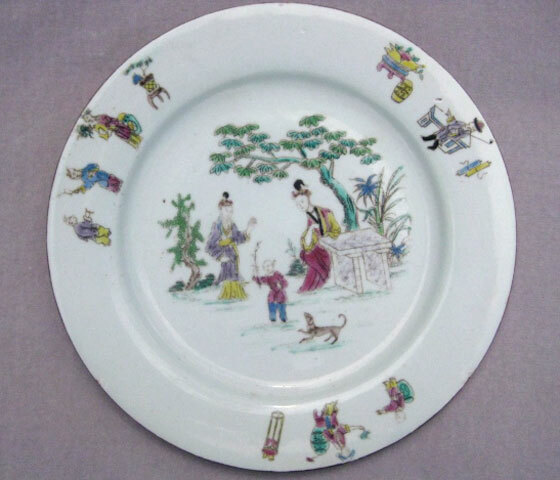 C 102 : A Bow plate with an outlined printed scene and coloured with two Chines ladies , a child and a dog in a garden. 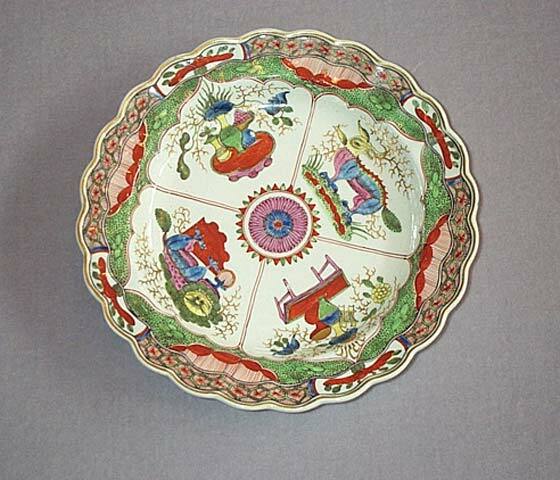 Further decoration to the border.